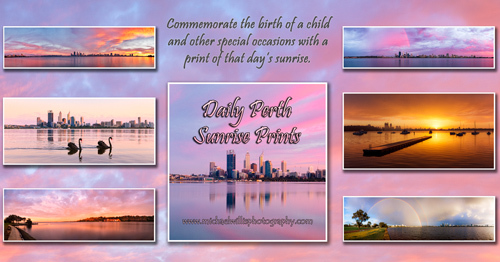 Photographs of every Perth sunrise throughout June 2012. After clicking on the thumbnails below, a new window will open showing the image at my pbase.com galleries. Unless otherwise stated, the images in these galleries are all open edition prints. In most cases, if the image shown on a particular day happens to be a limited edition print, a different open edition print may also be available. If you would like to see more images from particular date, please fill out the contact form with your enquiry. Pricing for all of the unframed open edition prints in this gallery can be seen in the table at the bottom of the page.